When I applied for my job at Chez Panisse, I’d just left a restaurant where the chef was, what we call in the business, a “screamer.” One of those chefs who flips out in the kitchen and yells indiscriminately. Contrary to what television might lead you to think, this isn’t a new phenomenon. I didn’t really yell all that much when I was a chef. But whenever I would see someone wasting something as precious as raspberries, and letting them go bad, then I’d have a word with someone. Shelling beans are another precious commodity. Although they’re not terribly expensive (one pound cost me roughly €2/$2 in France), they do take a bit of preparation and I remember preparing a meal for a group which included a nice pile of fresh shelling beans as part of the main course. Then watching the plates come back into the kitchen with a majority of the hard-earned beans untouched. Merde! 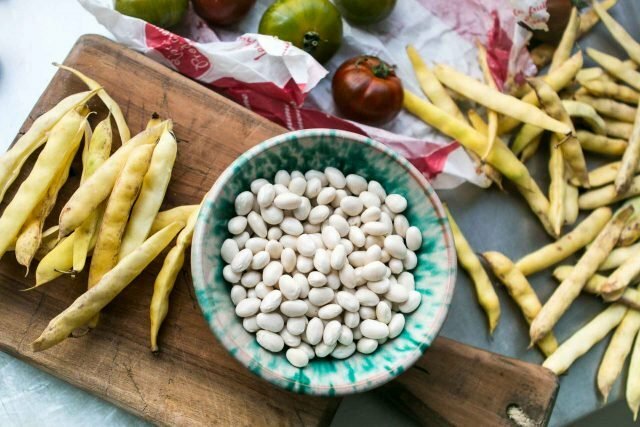 Fresh shelling beans make their appearances at the market in late summer and during the fall. In France, the most famous are the haricot de Paimpol from Brittany, which are so esteemed, they have their own AOC status. Some have wild markings, like Borlotti beans, which have lovely shades of red, rose, and white on the pods, and on the beans inside. They’re really easy to prepare; just peel off the husks then simmer the beans in gently boiling water with a little salt it in. When they’re done, I douse them with olive or in enough vinaigrette while they’re still warm so they absorb the flavor of the dressing. 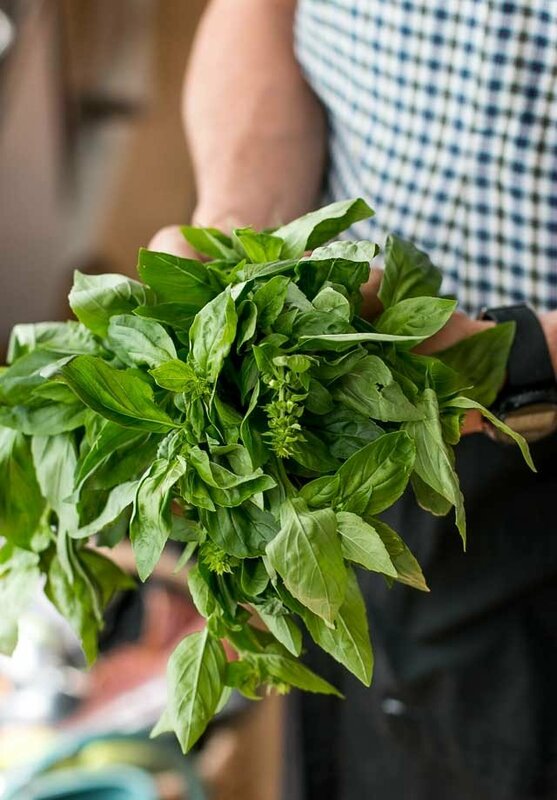 Any fresh herbs you want to add – basil, mint, parsley, or tarragon, make a nice addition. Even easier is just to drizzle them with walnut or hazelnut oil and a bit of sea salt, then let them cool. You can use a favorite vinaigrette (about 1/4 cup, 60 ml) and perhaps include a chopped shallot to mix with the warm beans, too. A handful of fresh herbs is delightful, but I wait until the beans are cool to add them so they don’t lose their oomph. 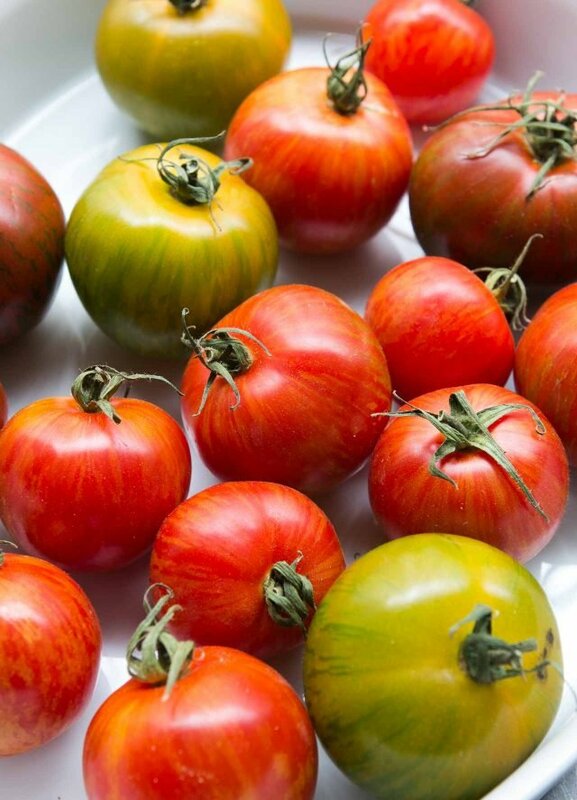 I enjoy them often tossed with good summer tomatoes and lots of fresh basil, or basil vinaigrette, which is pretty much my favorite summer salad. 1. In a large covered saucepan, bring the water to a boil. 2. Add the beans and any of the optional herbs. 3. Reduce the heat to a low boil and cook for 20-305 minutes with the lid ajar, until the beans are tender. But be careful not to overcook them. You may need to add more water while they’re cooking. 4. Drain the beans, then toss with while warm with vinaigrette, olive oil, or a drizzle of walnut or hazelnut oil and sea salt. To serve, add a handful of fresh herbs, such as thyme, chives, or basil. Toss well, and mix with tomatoes or par-boiled green or yellow beans. Er–sounds good and very healthy. Now, excuse my ignorance when I ask this, but how does one get beans shucked–is there some sort of “shell”. I’m also asking, because I am contemplating another bean recipe from scratch and am not sure about what do with ’em right out of the supermarket packaging. I love ’em too. I was going to go out for lunch, but the pile of herbs in my fridge is not going to last forever. Beans and pesto it is. sounds delicious! where could i buy these beans in paris? It really is a great recipe and a good way of eating beans. We generally cook them with onions, tomatoes and carrots in olive oil and eat them as meze(appetizer) in Istanbul. I will sure try your version! I hate wasting food as well. Using up lefover produces makes me creative and I love that. Gorgeous photos of the cranberry/borolotti beans. Thanks, David — I saw the haricots coco (from Paimpol, no less) at the marche this week, but wasn’t sure what to do with them. Now I know, and I suspect they’ll show up on our table before the week is out. Can I use scarlet runner beans? This sounds wonderful. I’m always looking for new excuses to cook beans. I could eat them everyday! Very interesting post, as usual! Faire revenir de l’ail dans de l’huile d’olive au fond d’une casserole. Y ajouter les mogettes, remuer jusqu’à ce que les mogettes brillent (comme pour le riz dans un risotto). Couvrir entièrement avec de l’eau bouillante. Ajouter deux ou trois tomates coupées en quatre, quelques carottes entières, deux oignons coupés en quatre, deux ou trois feuilles de laurier et un peu de thym. Saler et poivrer. Couvrir puis laisser mijoter jusqu’à obtenir une cuisson tendre puis déguster chaud. No waste with these speckled babies! I managed to can a few jars out of my garden this year but not nearly enough. So I am waiting for the big bags of Cocos to appear- shelling 20 kg is an afternoon’s meditation. Oh, any leftovers made great refried beans for those pesky Mexi-cravings. I am amazed at how many people don’t know the difference between the dried version and the fresh version. I like the dried ones, I LOVE the fresh version. If it’s a good year I will blanch and freeze some canellini, but in recent years there has been a blight leaving few for us amateurs. I like a bit of salt, a spicy olive oil, a grind of pepper. I just cooked cranberry beans for the first time last night. Made a little sauce with roasted garlic, thyme, shallot, and white wine, and tossed them in with pasta. It was delicious. I’m now a shelling bean convert. I’m going to buy a bunch more and start drying them, so I’m excited to have more recipes to go with them. I absolutely LOVE fresh shelling beans. They are one of my favorite farmers market finds, and I eat them as often as I can when they are in season! I placed a rancho gordo order recently and I think I will make up a batch today. YUM. Thank you for a wonderful recipe for fresh shelling beans. Spring here so NZ bean time isn’t far away. I grew up being served grey beans – over cooked revolting runner beans or the frozen stuff ( and still overcooked). Am finally recovering from the “boil them till they’re dead” horror to appreciate really great fresh beans. Huge relief – Having Crohn’s disease thought they were a no-no – nope fresh and properly (briefly) cooked I can enjoy so many types now. Still loathe the runners. Bravo David. And a big thank you. When I was growing up in the late 70’s and 80’s, my family raised berries to help supplement our limited income, (a small farm). Picking berries is very hard, hot work. Tending to raspberry, blackberry and other ‘thorned’ shrubs is also hard and sometimes painful work. As a working gardener, I really appreciate this thoughtful article leading up to your delicious recipe. More people are thinking about where there food comes from these days, and hopefully with the help of writers like yourself, more people will adjust their thinking about the value of the food they eat. 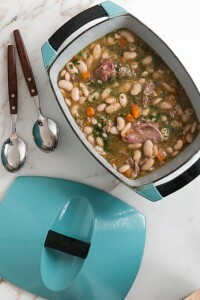 My gramps (who did all the cooking) used to call these “shellie” beans – or maybe that is just what I thought he said. (We are from the Southern US.) :) Love them – it took me back immediately. Those beans are beautiful! I’ve never prepared beans like that… might have to try it tonight! Fresh shell beans are great, a hearty counterpoint for summer’s bright flavors. One of the dishes that sticks in my memory was a simple shell bean preparation, with the perfect herb combination and ideal cooking time. And so, seeing the baskets at the farmers market, I’ve been cooking them myself. The most recent experiment was to cook them with bay, rosemary and thyme, add some chopped tomatoes in the last few minutes, and serve with rough-cut fresh pasta. Perhaps this weekend I’ll try your salad. I actually use to dislike beans greatly until I tried them in a bean salad similar a few years ago. Now I can’t get enough of them. 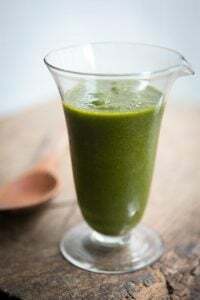 They are a healthy delight that can be made in so many different ways. Such a great recipe David. Thanks for sharing this. Glad you got away from the screaming massacre and can work in peace until someone lets something go bad. hi david.i can’t remember if i worked at the chez before you or after you but i was in the saute position in the cafe for a year from ‘ 82-‘ 83 and then went on to run zuni cafe for the next several years. i’ve been reading your posts for awhile now and wanted to thank you for sharing all of the fabulous recipes and stories. we served many dishes with shelling beans at zuni but i especially like a ragout of them as a bed for grilled sausage. Eating fresh shelling beans was a literal revelation to me the first time I tried them. I found them at my local, excellent farmers market, and that I – WE – had been so completely ignorant of the stunning difference eating Fresh Vegetables makes, just really impacted me. Beans did that. And freshly picked beets, actually. Long ago, I made Borscht from beets that had been picked that morning and was simply blown away by the profound difference. So simple. Freshness needs so very little embellishment, which of course all Chez Panisse fans know. I think that they were organic probably made a big difference in flavor as well. Changed the way I shop, for sure. Those beans are so pretty. I’m inspired by this one. Thanks! My last chef before I left the restaurants was a “watcher,” as you put it, but usually only because he was so drunk he couldn’t handle a knife. Yum! I love beans too! 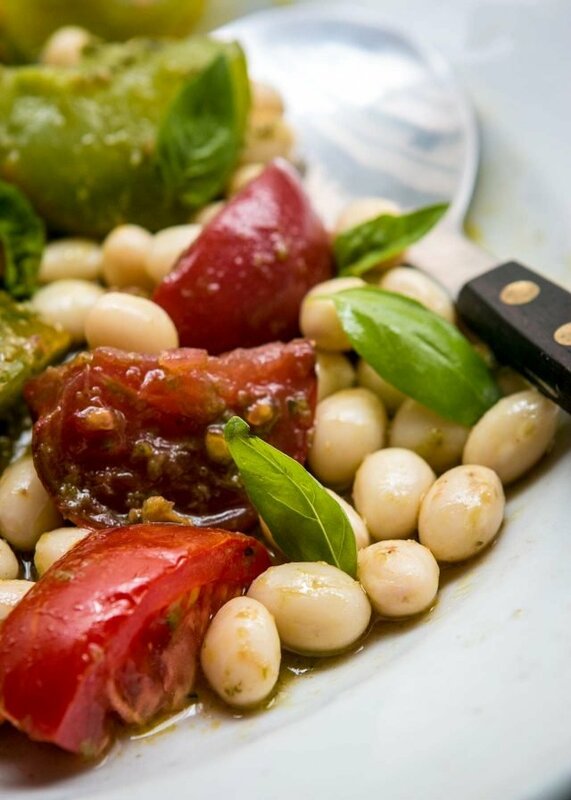 That fresh bean salad looks so delicious, thanks for a nice post David! And I agree with the not wasting precious food, especially when it comes from the farmer’s market or the garden. I love beans and work them into most of my meals. The simple preparations are always my favorite. Yours look just perfect! I was probably the only kid on my block that was actually excited to eat dinner when Mom said we were having lima beans. I’ve always loved shell beans of any kind, I can’t imagine what’s happening in the kitchen when people almost boastfully say that they hate beans. I know that old dry beans can be not so good, but even fresh or flash frozen get the big ‘nix’ before they are even tasted. Fabulous post David. I really like to add colour to any dish – makes it so much more appealing. Food that looks enticing somehow has a knack of tasting better too. I am gonna plant some cranberry beans next year. The pic of your beans cooked up and plump made me drool. Literally. No lie. Back in the day when hubby and I toiled away in the restaurant biz the only thing that got my man’s blood a boilin’ was inattention – as in not rotating goodies in the walk in or letting food slip out to the table that were not perfection. A small note – there are several varieties of thornless raspberries. I grow one such in my yard. Now if only I could find a thornless backberry! I know one must exist. OK – godda go lie down. Just picked oh…100 or so pounds of plums… about half of the fruit. What to do… what to do. Sigh. Oh, I love beans, too, and order them from Rancho Gordo! They are special. We are trying to eat more meatless meals and rely on beans a lot. I grow a variety of raspberry named “Fall Gold.” They are golden yellow (birds don’t recogniize them as something to eat), ripen in spring and fall, and and are the sweetest raspberries ever. Still, they are something of a novelty. I can’t imagine that they could even be shipped as far as across town. Because this summer was a rainy one, the ever-bearing Tristar strawberries are still giving me a double handful per day. When I save up we can have strawberry shortcake every third day. I wish this bounty happened every year, but only cooler and rainier summers than normal make it possible. I love fresh beans, too. Lima beans also are completely different fresh than canned or frozen, but nobody seems to know that. It’s a shame, because limas are a bean everyone with even a small garden could grow. Talking about shelling beans makes me think of the stink beans (petai) that we used to shell as kids back in Penang. Their skin is like leather and they didn’t just pop out when squeezed. You usually need a knife to make slits and you also have to peel off the skins that cover each bean. So much work, but it was worth it. In the old days petai was picked from huge trees that grow in the jungle, so you can imagine how dangerous the work was. And yet the price was only marginally high and the average household could still afford it. Nowadays the beans are being cultivated. I’ve just started reading The Sweet Life, and savouring every page. The part about cooking du marche made me think how things have changed. Growing up, we took local produce for granted as most of it was bought fresh from the wet market nearby on a daily basis. Imported foods from temperate climates like oranges & apples, were considered luxury items! Ironic isn’t it? I love the appearance of cranberry beans, the vivid fuchsia pink color just looks like someone took a marker and went completely crazy! Oh what a fun food! I saw the word ‘hazelnut’ so I have a jumping off point. I am here in Paris as a jeune fille au pair. I was with the kids yesterday at Parc Monceau, and after stomping marrons for about 20 minutes, we moved to the fallen bearings of the next tree- hazelnuts! I collected- a decent amount. I would guess 300 grams? (With shell obviously). I was wondering if you had a recipe that would optimize the hazelnut in its limited amount. Also, I just found a website last night that provides a middle ground between small-organic farms and novice volunteers. I would love to get in on Vendange- albeit just one day, perhaps- so I think I may just check it out. Wwoof.org, I think some others here may appreciate it too. Mmm, I love Paris in Autumn. Then again, I come from Las Vegas and we don’t have so much what you would call ‘seasons’ there, so this is somewhat of a small miracle to me. Ps- I was out of town last time you were at WH Smith, plans for a repeat? This looks lovely. I am in love with fresh shelled beans. I’ve never come across fresh beans like this, around here (in Texas) we have a lot of purple hull, cream peas, and blackeyed peas though. Never liked them, until I ate them fresh. What a difference! Now I buy as many as I can handle fresh, and freeze them – they’re still better than dried. Those beans I can’t get fresh, however, I do buy from Rancho Gordo, it’s worth it! I too love beans and fresh shelling beans are the best! A couple of weeks ago at a small Farmers Market in the Santa Cruz Mountains (Scotts Valley, CA) I found a vendor with fresh Gigantes (as they spelled it). Have never seen those fresh so bought a nice bag full. Cooked up in about 35 min in a bit of homemade chicken stock, added some diced fresh Early Girl tomatoes and of course, garlic, kosher salt and fresh black pepper – had all I could do to keep from eating them all up but my conscience kicked in so I left some for my dear husband… Have never seen fresh Gigandes (as I know them) before and wish I could find more of them! You mentioned the pressure cooker above, yes, I like to do dry beans in the pressure cooker. They freeze beautifully and are so much better than canned! Especially garbanzos – my all-time fave. I have a 5 qt and a 10 qt Fagor – they are great time savers – especially if you’re like me and decide at 5:00 pm to make osso buco or something like that! Plus as a life-long chicken soup maker, the product from the pressure cooker is the best. Found some at the farmers market this morning, yippeee! My mother sent me to your blog. She is the ultimate foodie – and has been for 80+ years. I can see what she sees in you. (She visits you every day – me, not yet.) Love the way you write and love the recipes I’ve perused so far. I’ll be back – there seems to be a lot I have left to learn from you! We call this kind of salad as “sundal” in India. With a simple tempering with oil,mustard seeds and drid red chillies broken and grated rfesh coconut they taste divine. Try them with coconut next time. I bet u’ll love it. Great salad – I think these beans (especially their pods) are so pretty! As you suggested, a bit of hazelnut oil and sea salt and I’d be screaming for these as well. Never has a photo made beans look more divine. I have been missing out on my beans, I’m not going to lie! This seems like the perfect way to do beans in a new way. I never thought of herbs like basil for beans at all. I’m going to try this right away. Since I’m vegetarian I think that this will go over well in my household. Only thing left to do is pick the wine to go with it. Anyhow, thanks for the post. I’m going to ask my neighbor for some of her beans – she always grows more variety than I do! 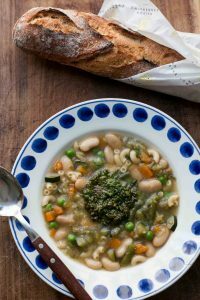 I love this post – I love beans and eat them often, but had run out of imaginative ways to use them in their freshest incarnation. I have to say though, that I am now mostly obsessed with the idea of the lima beans cooked along with a roast and getting crisp. The first day it’s cool enough here, I’m all over that. Hum…incroyable tous ces commentaires pour…des haricots ! C’est génial, great ! Vive votre blog ! These beans…sont toute mon enfance sur les marchés corses… they are beautiful, inside as outside, just like a perfect world….We love them ! Thanks David. I often say if diners knew what it took to grow a succulent peach or sunripe heirloom tomato they would neither squeeze them nor balk at paying a premium price for the little treasures. In the realm of letting food go to waste, most gardeners are guilty and I am no exception. Some plants produce faster than I can pick. By the way, know of any recipes for zucchinis the size of scuba tanks? Borlotti beans are beautiful, they become that nice mottled colour as they start to dry. I grow the variety “Lamon” available from “Seeds Of Italy”. Although I would advise careful cooking, it is important that they are properly cooked even if they are freshly shelled. They are also the main ingredient in Pasta e Fagioli, one of my favourite dishes. Those Tomatoes look wonderful, far better than the uniformly shaped and coloured rubbish you find in supermarkets.